This section contains a variety of videos to give you a feeling for the Sun City Center Community Association (SCCCA) clubs and their sponsored activities. As we create the videos for each of the clubs, we will endeavor to list them in alphabetical order; but if you do not find what you are looking for, scan the entire list as the name may differ from the activity itself. You may also open the below link to the Sun City Center Community Association website that contains a description of many of the clubs. Finally it is suggested that you check with the SCCCA office to ensure the contact information for any given club is current. To contact the Sun City Center Community Association website just click on the button to the left, or the title of this section. Doing so will take you into the SCCCA club directory, then click on the Activities tab. Be aware that it may not be up to date and the information provided should always be checked with the CA office. The phone number there is 813-633-3500. Click on the picture, title to see this directory. 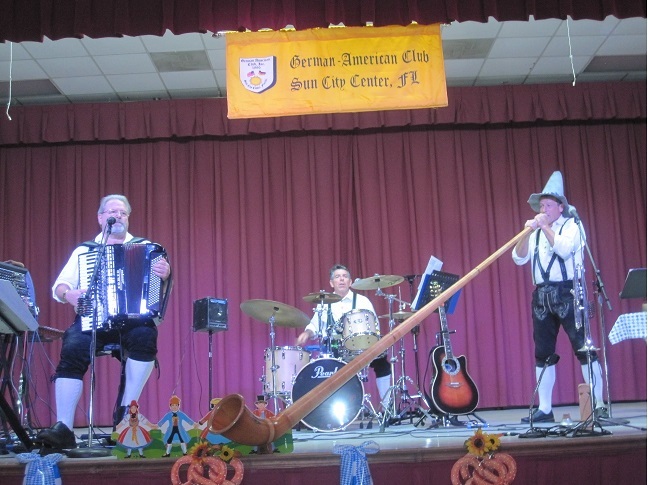 The Sun City Center German club is one of our largest clubs and has at least 4 major events each year. The Parties are always lots of fun and the bands, although having a definite German beat to them, play some very danceable music. Click on the picture or the title to see this German Club video. The Sun City Center Square Dance Club is one of the oldest clubs in Sun City Center. In this video, you will meet the co-presidents for 2009 and learn about the club as you share the fun of their 40th anniversary celebration. Click on the picture or the title to see this Square Dance Club video.